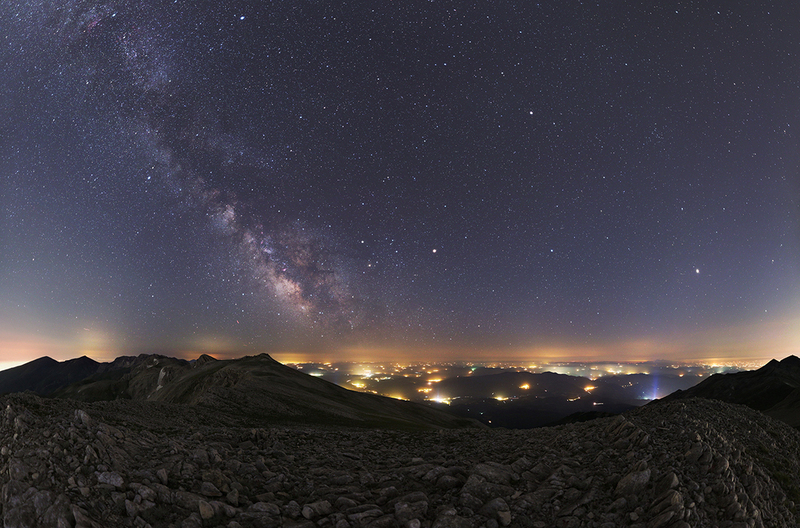 Explanation: Lights sprawl toward the horizon in this night skyscape from Uludag National Park, Bursa Province, Turkey, planet Earth. The stars and nebulae of the Milky Way are still visible though, stretching above the lights on the northern summer night while three other planets shine brightly. Jupiter is at the far right, Mars near the centre of the frame, and Saturn is just right of the bulging centre of our galaxy. Because the panoramic scene was captured on July 6, all three planets pictured were hosting orbiting, operational, robotic spacecraft from Earth. Popular Mars has five (from three different space agencies): MAVEN (NASA), Mars Orbiter Mission (India), Mars Express (ESA), Mars Odyssey (NASA), Mars Reconnaissance Orbiter (NASA). Ringed Saturn hosts the daring Cassini spacecraft. Just arrived, Juno now orbits ruling gas giant Jupiter.